Save the Date cards are announcements that inform your guests of your future wedding in order to keep your special day free. They are essential when planning a destination wedding. 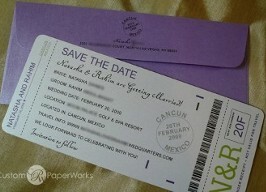 Save the Dates are generally sent to guests approximately 12 months in advance. 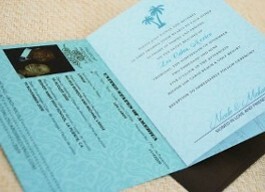 This allows your guests to make the necessary plans to attend your wedding. Flights can be booked 330 days prior to travel. Rooms at the resort can be booked much earlier than that. Guests will probably need time budget and save vacation days at work. You may be surprised by how many guests will turn your destination wedding into an entire family vacation. All of this takes time and planning, so let your guests know as early as possible. Your Save The Dates must include your names, your wedding date, your destination and most importantly, your website address! We set up your website to include all of the details your guests need to know about your wedding. The website is where they will go to get a quote, or to book their room. "To RSVP, please visit our wedding website and make your room deposit by October 1." We’re having a Destination Wedding! We would love to share this special occasion in paradise with the people who mean so much to us. We hope that you will “Save the Date” and prepare for a wonderful vacation! We will be married at the luxurious El Dorado Royale, located in the Mayan Riviera, on December 31, 2017. To RSVP, please visit our wedding website (www....) and book your room by October 1. See you in Mexico! at the Secrets Palm Beach Resort. who share in this very special event. and support will be felt across the miles.